The news is especially good for Bill Haslam, as he leads all around. 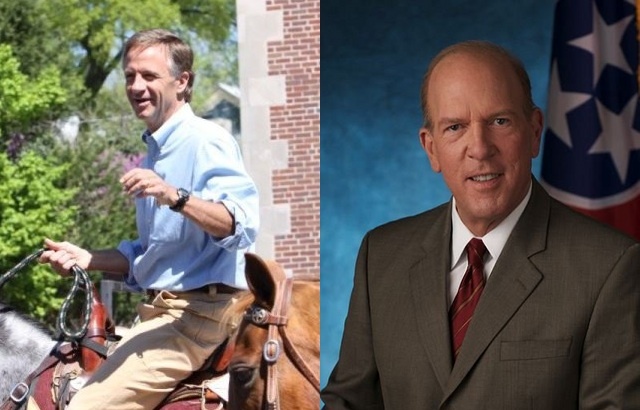 In the Republican primary he leads with 36 to Zach Wamp’s 25 and Ron Ramsey’s 20 (MoE 5) for a clear 86% probability of leading Wamp in my estimation. In the general election carpet bomb, Democrat Mike McWherter trails all three men. He’s close to Wamp and Ramsey though, only behind 45-38 and 43-38 respectively, but his support tails off strongly against the frontrunner. McWherter is behind Haslam 49-31 (MoE 4 for the general), giving McWherter a tiny 2% chance of being up. THANK YOU for posting this! Keep up the great work! !